Having completed the re-bedding of the 6 Chain Plates, which required slackening the 4 Lower and 2 Upper Shroud Turnbuckles, I needed to tune the rigging. So we made a last minute decision to take the boat out on Sunday, staying overnight Sunday & Monday and return to the dock Tuesday Morning. On the back side, we had setup for divers to come and clean the bottom but didn't have an actual date for that, we decided we would call them Monday morning and head back early if their plan was to do the boat that day. Sunday morning we did our routine of getting everything together for a couple of days away on the boat. We had our list, Meals, Drinks, Meds, Clothing, Bedding and Fuel for the Genny as it was going to be hot that weekend. Arriving at the boat around 10am was fine, we had to leave by 11am in order to have deep water in the canal as the tide was going out. We quickly loaded the boat, stored the food in the Fridge/Freezer, eased the lines, tested the Engine and cast off in time. It was an easy passage down the New River, Engine ran well, Bridges opened quickly, no snags. But as we passed the Fort Lauderdale Marina, I noticed that the wind had picked up a lot. So much for the 8 to 10 knots forecast, we were seeing 20+ knots! 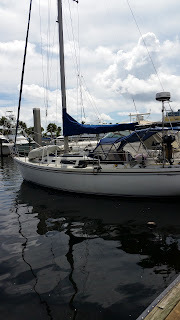 So I changed our plan to adjust the rigging under sail on the Ocean and decided to do the initial adjustment of the rigging just the other side of 17th Street Causeway Bridge, so we turned at the West Nun Buoy so that the wind was over the Port side and 1st adjustment made. Then we turned back to the Nun Buoy and, with the wind over the Stbd side, made 2nd adjustment. Then the Police boat headed out way! Oh Oh! We were in the Security Zone, so they politely asked to move back to the Intra Coastal and to check out Charts. Local knowledge just improved. The wind was still in the high teens and we just didn't feel it was worth going out, so we headed back toward Lake Sylvia, we could sail the following morning if the weather improved. Picking an anchoring spot on the lake, we quickly set the anchor and opened up the boat to allow the breeze to cool it down, it was in the high 90s °F. I set the anchor alarm and the new Snubber that I made a couple of months ago, securing it to the anchor line with a rolling hitch. Worked like a charm. Once we were secure, it was time to chill. Bottle of wine, crackers & cheese, setup some music in the cockpit, life is good. During the afternoon, several more boats arrived and at one point there were 21 boats anchored on the lake. Kids were having a ball trying to ski around the lake behind jet skis, there was more than one boat having a barbecue and several boats seemed to be empty. We all swung around our anchors as the tidal flow changed. It's quite usual on Lake Sylvia for boats just 100' apart to experience current flow in opposite directions, so the boats around the lake were pointing this way and that, seemingly at random. Heavy clouds rolled in later in the afternoon, several of the power boats pulled their anchor and left, we just closed the ports, took the cockpit cushions below and put up the dodger screen. It didn't rain much. Dinner was to be Ravioli and Veggies, but the Veggies didn't make it, they must still be in the Freezer at home. Not a biggy, cut up some tomatoes and drench them in olive oil, add some Blue Cheese Dressing and dinner fit for a king. Note to self, we really should check off the items on the list. Chatting in the cockpit after dinner, Peggy realized that the Veggies were not the only thing left at home, the bedding were never packed! Not a biggy, we keep several blankets on the boat and had spare pillow cases. So I setup the Generator and got the Air Conditioning running. With the boat closed up due to the potential rain, the AC made it bearable below. We left it running and got turned in. Weather forecast was looking good for Monday, great, we could get out for a sail. It rained several times overnight and we try not to run the AC during the rain as we cover the Generator, so neither of us got much sleep. During breakfast we decided to head home as soon as the tide and bridges allow. That meant getting to the first bridge soon after 9am, after the morning rush hour bridge closing. Taking the Snubber off took a while longer than our normal routine of just pulling the anchor, but lesson learned, I'll make a Dynema Loop that I can use to tie a Prussic knot to secure the Snubber to the Anchor Chain. We easily motored to the 3rd Avenue Bridge around 9:30am and called Andrews Avenue Bridge to request an opening. We had to hang around a couple of minutes as there were pedestrians on the bridge delaying the opening but we handled that easily, staying East of the outflow just in case - good decision, they opened about 200' ahead of us. Andrews opened and we moved over the North side the river because the Bridge Span hinges on the South side and it does not open fully vertical. As we approached the bridge, the Tender called to advise that he had heard the FEC railroad bridge was about to go down, but we might make it if we put the peddle down. We did and passed the FEC bridge which closed about a minute after we passed and called them that we were clear. The FEC bridge is our biggest concern in transiting the New River. If it was closed for a lengthy period while a freight train slowly passed, that could cause us to miss our tide chance which could mean not being able to get to the slip for an additional 6 hours. At present there is no published schedule for the bridge closures, but there is supposed to be an App coming out that will advise of the schedule - perhaps next year! 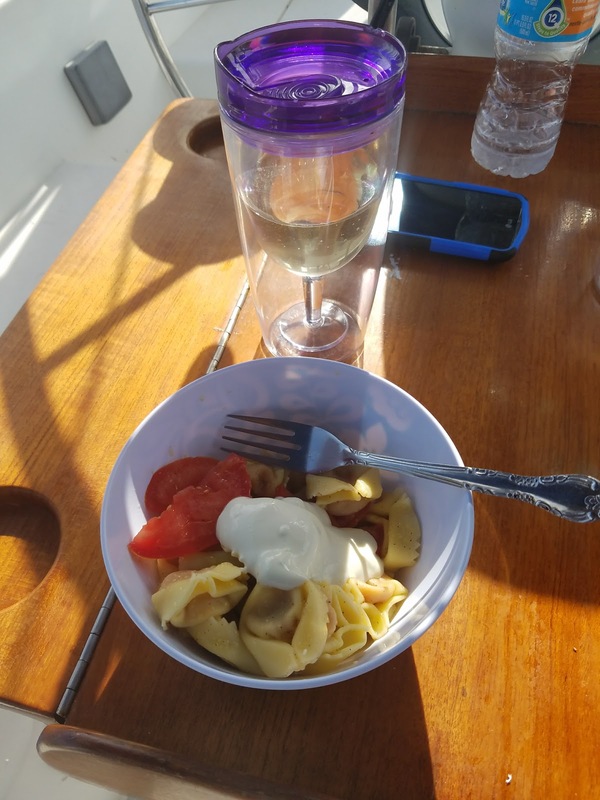 I never get bored being on the boat, there's always something to do. So while waiting for the divers , I replaced the small solar lamp above the Bimini and repaired the Speaker wiring that had broken when I was doing the chain plate work. Then I read a copy of the Mainsheet Magazine that we had on board, especially the article about how another C34 owner had modified their dodger to increase the height, which is one of the things Peggy has asked me about. I raised the Mainsail in order to measure the height of the boom with the sail fully deployed - It's 6' - as per the instructions I gave the sail maker when we had new sails made last year. Then I sent a couple of emails to the divers letting them know I was there and wondering what time they might arrive. Turns out they had arrived shortly after we left the boat to go home! I thought the hull waterline was not looking pretty good - Duh! Stowing the Mainsail, checking all the lines, valves, and switches, I left the boat and headed home. Sometimes, things go according to plan, and other time serendipity steps in.